I am so excited for the fun that will be going on atPapertrey Ink for the anniversary! It really all starts today, then goes up to the release. Today Nichole asked ALL the team members to make a card with thier favorite Papertrey Ink set of all time. Now the BEST part-leave me a comment and YOU can have a chance to win! Jennifer will be choosing a winner so the comments close MIDNIGHT-12am Pacific time. 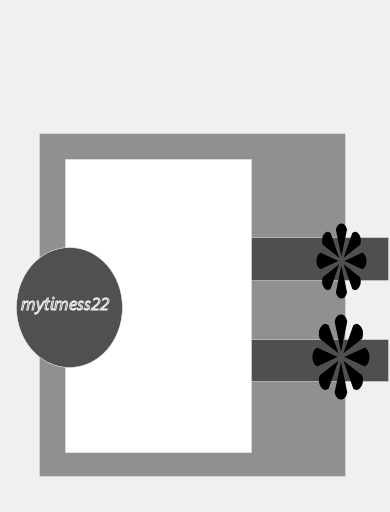 You can say whatever you like, but I personally would love to know what My Timeless Template © has been YOUR favorite (OH! BOY! Wait until what you see we have this month-and hold on to your adhesive because next month will blow you away! LOL! My best template yet), and what Papertrey Ink stamp set (if you can pick ONE!) is your favorite. Let me say that was NO easy task for me! My recent favorite color combo is Raspberry Fizz, and Ripe Avocado. I’m just in heaven. This is a close up view of my card. 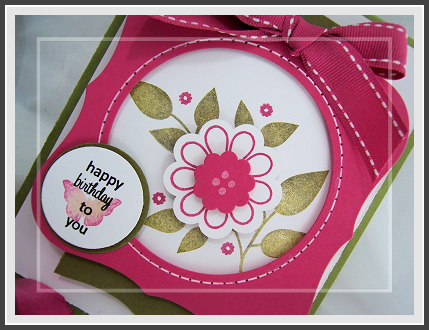 I die cut a Label 1 from Raspberry Fizz, then die cut a circle from the center. I then “faux stitched” around it, to make my frame! I love this set. 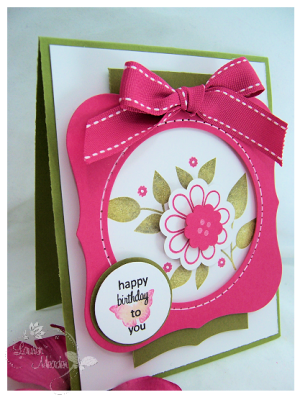 I especially adore its co-ordination with the Cuttlebug Flower #1 dies. I love the dimension this all has. The leaf image is just gorgeous too. My set is BLACK from all the use! LOL! It is my “go to” set. We all have one I believe. I also had to add a butterfly in there too! LOL! I *almost* picked the With Sympathy set, but its new, and hasn’t had as much love-YET! But I did use the butterfly from it. Heartfelt Basics-OH! If there was ever a sentiment set to get! Polka Dot Basics-DUH! Who wouldn’t love it? Spiral Bouquet-I love all floral sets! LOL! Wise owl-how can you NOT love this one? I adore the leaf and flowers in it too!! With Sympathy-Oh its just SOOOO pretty! Then ALL Borders & Corners-ALL but Circles are tops for me! Ok I rambled enough! LOL! Your turn! Now don’t forget to check out the other team members for your chance to win their favorite set! Thank you for stopping by. I can’t wait to hear YOUR answers! He’ll make a box to put it in! Or at least I would! LOL! That is what this next image reminded me of! Keep in mind I HATE mice and rodent! But he was cute. So I accepted him into my stamp room. 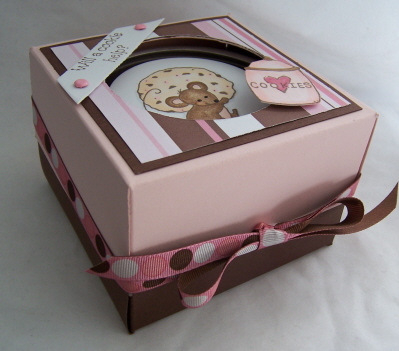 I designed this cute little box. . The way it folds together is really cool! I’ll share that very soon!! I was proud that I could do this with a heavy, groggy head. 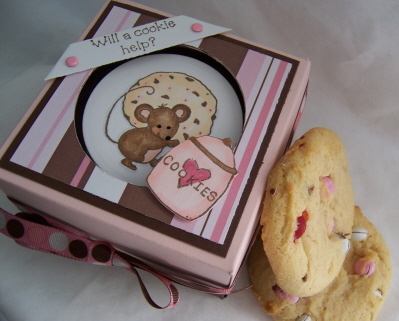 It uses a stamp from a set by Cookie Crumbs (aka Diane Zechman) called Cookie Jar, and Cookie Jar-gon (not that is a pretty darn clever name!). It is due to release through All That Scraps, on Monday the 2nd. Be sure to enter to win this set—>HERE!as well as check out the DT samples! (Insert name) stole the cookies from the cookie jar! 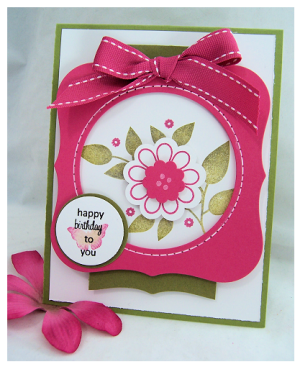 Its great because you can use 2 colors of cardstock or patterned paper. That holds a tin of 5 cookies 😀 Like a cupcake box, only it is holding a tin instead. 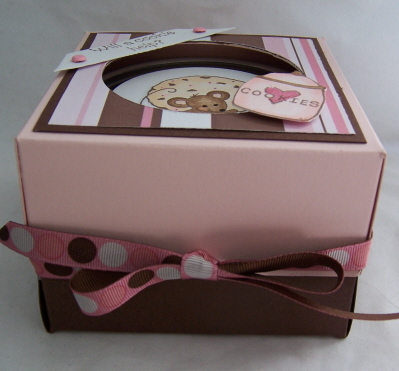 I have been asked NUMEROUS times to create a “cupcake” box, and so I have done something similar-finally! No worries I’ll share the how-to’s soon!! Its a great size box too! Im over the moon with it. I cut out a circle in the top so you can see the tin. 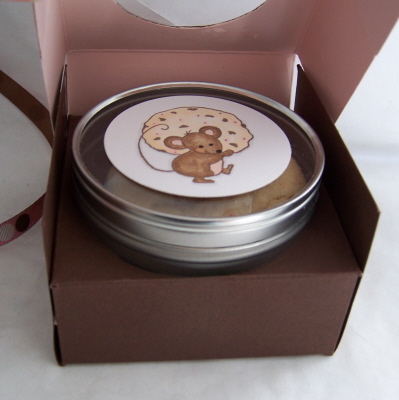 I didn’t put acetate over the window because of photographing (didn’t want a GLARE), and the cookies are protected in the tin inside. Sorry I didn’t get all fancy decorating my tin. I had all I could do to make the box and still be standing :C But you get the idea. I love this image from Stampavie called Jump into my pouch! You can also find that HERE! I think its just so sweet, and perfect for a baby card! Especially for a mom of more than one “roo” I find that finding images for the celebration of additional “additions” can be challenging. So I was “bouncin” (sorry had to do it) over this one. I was inspired by my ribbon for my color scheme. Seemed to be very gender neutral. I colored with my copic markers, and sponged my sky and sun. I used prima’s and decorated them like the flowers in the image. This sentiment from Papertrey Ink Bitty Baby Blessings, paired with Around and About sentiments. One of my friends is due to have her 3rd baby soon, so I thought it was cute to have the Kangaroo and her three little babies in her pouch. I love the middle one – upside down! Cute little feet. That is the cutest thing about new babies!! There tiny toes. In the meantime-I hope YOU get to try the sketch, and get a chance to see what the sketch team got done. Hopefully their MoJo isn’t in the gutter with mine! LOL! Send us a link here so we can see what you do. Have a HEALTHY weekend! Seems like MANY of you are going through the same ICK with yourself and or your children. Sending healthy vibes out to us all! What a crappy time of year.